I have 9 days until my preseason starts :( That means, essentially, 9 days of summer left. Once preseason starts, I'm back to waking up at 6:30 every morning and driving to my school. At least I will have the afternoons and nights, though. Officially, I have 23 days of summer left. Just a little of 3 weeks! I can't believe how fast it's flown. I can't believe I'm saying this, but I'm ready for school. Ready for chillier temps and fall layering. Of course, two days in and I'll be wishing it's summer again. Homework does that to ya. Oh yeah, speaking of which, I have yet to do my summer work. 3 books to read, one essay to prepare for, and half of a biology book to study. Ugh. How much time is left for you guys? i'll be in school by this time on monday... Ughhh, I'm glad i didn't have any summer projects this year! Good luck on your projects Rory~ i like the orange top very much! Love the colors. You look amazing in orange. this outfit is very colorful and wonderful. love love this color combo! and your tan. I will never ever be that tan... ever! I started today! Savor your last days. So cute! I love how bright this is and your skirt! Love this! The colours and that skirt, such a fun outfit. Looking fresh in orange! This is YOUR colour! 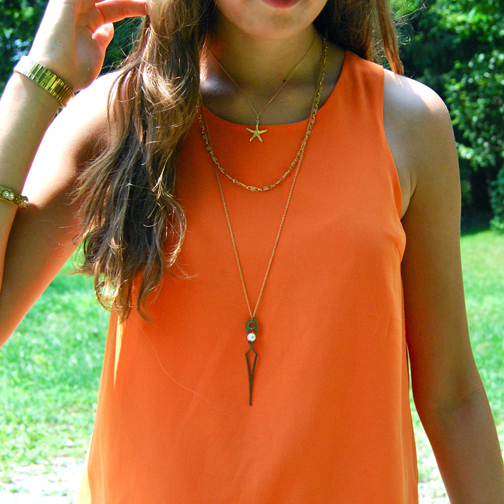 aaah orange looks great on you! Love that skirt! I hate that summer is coming to an end! This outfit is SO cute. Love the colors!!! 13 days left for me...aha, I'm excited though, albeit quite nervous too! College is a mixed bag of emotions for me. Haha, but I'm looking forward to it. Enjoy what's left of your summer Rory! I'm visiting via EBEW... 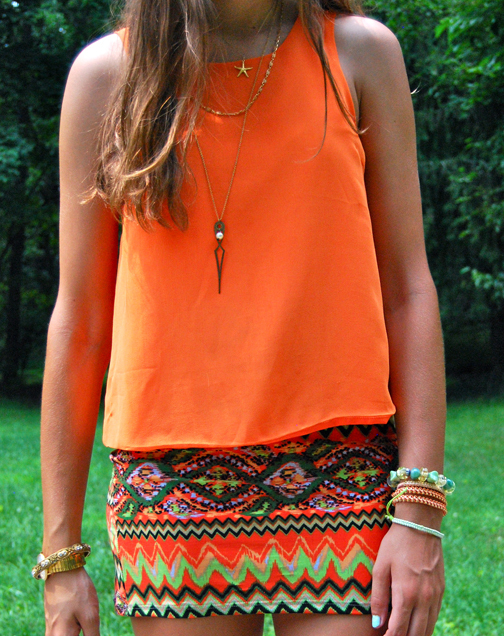 I just love the orange and the printed skirt! Your accessorising is soooo nice and I love your sandals... such a great look!!! This outfit is so freaking awesome! I absolutely adore that skirt..everything about it. And those shoes are so gorgeous. Popping over from EBEW. this outfit is so cute! I love it!! I'm ready for fall weather but not school! I really like this look. I didn't even think of a print that was mostly a color to work for EBEW today. Ooh I LOVE everything about this outfit!! The back of this shirt is so cool and the print of your skirt is awesome! Such a cute look! Loving your skirt and sandals! Where has the summer gone!! It has flown by! Visiting from Everybody, Everywear. This outfit is divine - love it! The print and the color are perfect together! Very vibrant and eye-catching! 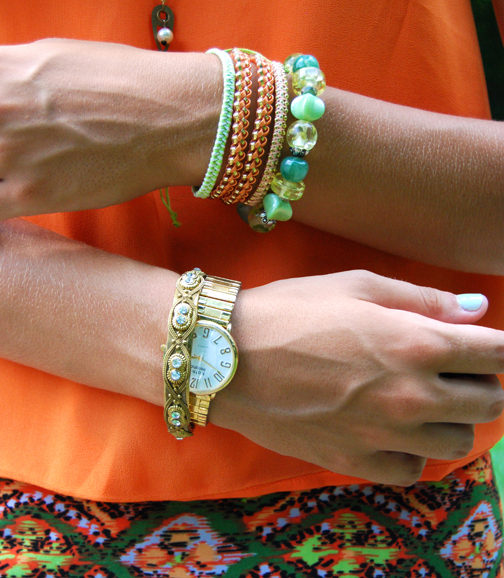 I love the orange and everything about this look! Lovely!